Drinking pure organic vegetable juice is the holy grail of health. So when is the right time to introduce it to baby? Read on. Finding the time to make a juice felt like a long lost dream in those first blurry weeks postpartum. But at four months, I thought, ‘we can do this.’ The first time I made a vegetable juice with Ajax in the sling, it felt like a triumph and I wondered why I hadn’t done it sooner. With Ajax snug in the Moby wrap, I would carefully chop several sticks of celery and carrot; tear off a few leaves of kale, slice a cucumber down the middle and pop it all in my Hurom slow juicer. By the time Ajax was 6 months things got a little more tricky; with his arms flailing around using a knife was too dangerous. But I found that offering him a celery stick kept his hands busy, and soon he could sit by himself on the floor beside me. From the start he seemed to enjoy watching the juicer pulverise all the veg, and liked touching the pulp as it emerged from the extractor. With his curiosity piqued, it wasn’t a problem getting him to try the juice at 8 months. So what do I drink? It’s not an exact science, and depends what the farmer’s market has on offer, but this is my typical juice. Why is Vegetable Juice so Good? Jam-packed with enzymes, antioxidants and vitamins, drinking greens is the quickest way way to get your five a day. Can you imagine how long it would take you to chomp through a board of veggies like this? Celery contains the antioxidant apigenin which is powerfully anti-cancer. 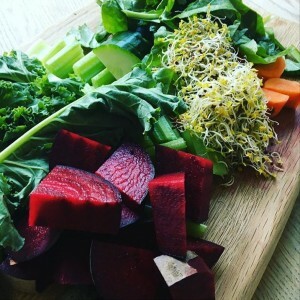 Kale and carrots are both rich in beta-carotene essential for vision, while broccoli sprouts ( always in my juice) are 100 times more powerful than broccoli. A 2011 study in Oncology Report found that sulforaphane – the active ingredient in broccoli sprouts – suppresses breast cancer growth. 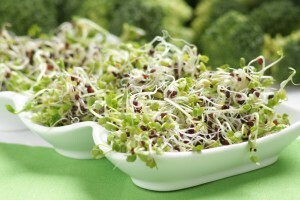 Broccoli sprouts have also been shown to switch on genes associated with detoxification, anti ageing and cancer-protection. While its beyond the remit of this blog to delve into the science of the NRF2 detox pathway, if you’re interested I suggest you listen to the brilliant podcast by Dr Rhonda Patrick of FoundmyFitness. So how much juice should you offer baby? Introduce it gradually, like any other new food, around 7 months. Start with just 30ml, diluted in filtered water and limit the intake to 50ml a day. And if you have the time, do share with me whether your baby goes for it! Bottoms up.